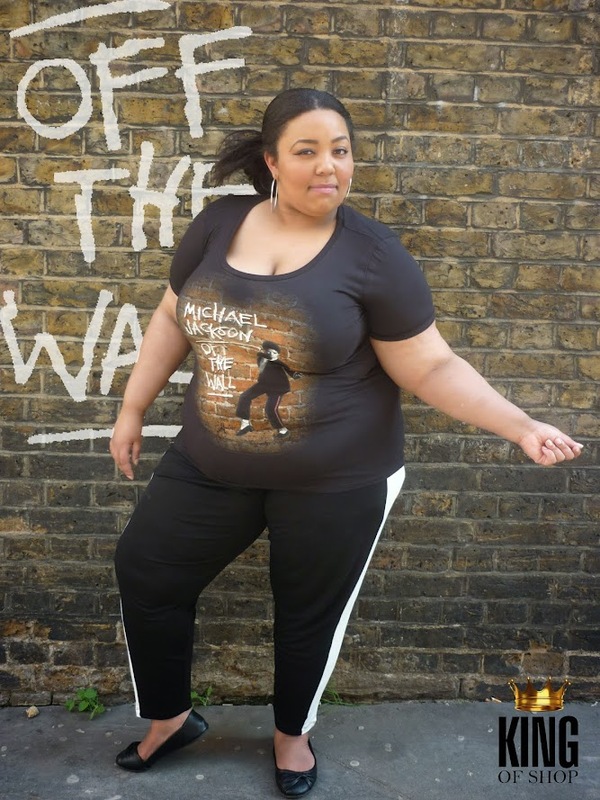 It’s no secret that I am a HUGE Michael Jackson fan and many of you know that myself and the other members of the King Of Shop team are always trying to bring out new styles and a variety of items in apparel. I am so excited to let you all know that we are trialling a new line of plus size t-shirts! Most of the official t-shirts to come from Triumph International and/or Bravado come in the standard S, M, L and XL with a standard round neck. Many of our customers have been emailing us and asking for different size styles and neck types and I personally am really happy to let you all know that many ladies fit t-shirts have come to the site for petite ladies and for some of the ladies shaped like myself… PLUS SIZE! I can’t contain my excitement! In the plus size range the sizes are available in 2XL, 3XL, 4XL and 5XL. In these pics I wear a 2xl shirt. A standard XL fits me fine but I wanted that extra chest room for my bust. Depending on your proportions you may decide to size up or down. What I love about this design in particular is that it celebrates one of the best albums to ever be recorded. Off The Wall is a much loved album for all Michael fans and many music loves worldwide. The world famous image used makes this one a classic design that has been received by fans for the past few years. The t-shirt is available at just £17 and would be a nice casual piece for the spring and summer season. Get yours here while stocks last! Thanks honey. That’s one of my fav songs by Michael!